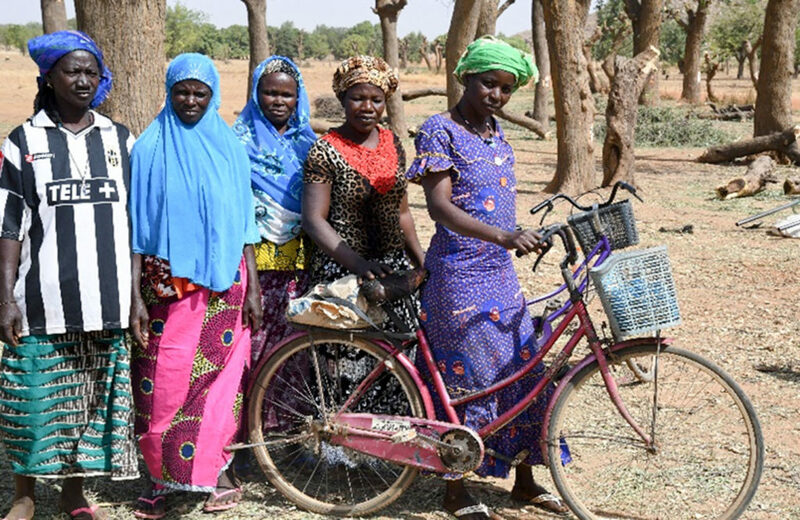 Ms Zombra Maimouna (with bicycle) and members of the Pagou women farmers group in Burkina Faso. Photo. A. Diama, ICRISAT. 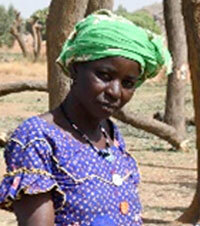 Ms Bambara Alizeta, one of the pioneer seed producers, says, “I used to grow a local variety which yielded very little. With SH 470P, I harvested two bags (200 kg) in over a quarter of a hectare, where I could barely harvest a bag. The seeds of the local variety were also too small and difficult to decorticate.” Alizeta attributes the increased yields to both improved varieties and good agronomic practices. “I have adopted row planting and many other improved practices that I have been trained in. I even applied fertilizer to my groundnut field!” she says. Fertilizer is a scarce commodity in these regions. Madam Clarisse, a pioneer community groundnut seed producer of QH 243C from To in the Western Centre Region, earned about US$ 300 from her production during that year. She had shared the seed with three new members and introduced them to community seed production in 2016. In return, these women will share their produce with three other women. “The project has involved not only women but our entire community in the production of quality declared seeds. 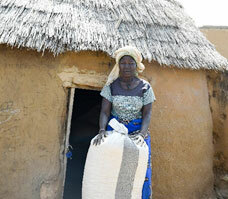 There are many others who can’t wait to start groundnut production,” says Alizeta. Following the success of the women participating in community seed production, men in the community have also started showing an interest in the practice. “When I saw the quantity of harvest that my wife got from her improved groundnut seed production plot in 2016, it was far better compared to what we get from our local variety. I said to myself, why is this project investing in just women? If only I could get this improved variety, I could compete with my wife,” says Biyen Gaston, whose wife is a community seed producer in To, Burkina Faso. The community seed system is effective not just for groundnut but is being used by women for other crops such as cowpea. Groundnut and cowpea are important food-and-feed crops in Africa and also an important source of income for producers, especially women. Several efforts to introduce improved varieties and increase adoption of these varieties have been made under the Tropical Legumes project, with the intent of helping smallholder farmers improve yields and ensure better incomes with varieties that are drought tolerant and resistant to leaf spot diseases and aflatoxin contamination. Within innovation platforms, researchers from several partner organizations are responsible for the introduction and dissemination of new high-yielding groundnut and cowpea varieties. The platforms allow farmers to access best varieties that are suitable for their use, thus facilitating better adoption and success of these interventions. The role of local partners such as INERA and extension workers who are constantly in touch with producers is crucial for selection of varieties adapted to the socio-economic condition of producers. This work was carried out as part of the Tropical Legumes III project funded by the Bill & Melinda Gates Foundation under the CGIAR Research Program (CRP) Grain Legumes till 2016 and CRP Grain Legumes and Dryland Cereals from 2018 onwards.